This can't happen in a city that bans guns, right? Here's the story: A Chicago firefighter was shot and seriously injured while responding to a fire on the Southeast Side at about 3:30 this morning. That's the link to the Sun-Times story; the Tribune, as of this writing, says only that he was shot on duty -- which could mean at the firehouse or at a fire. The Sun-Times story quotes Fire Department sources, so it's probably -- probably -- more accurate. According to the Sun-Times, the injured firefighter "works in the Office of Fire Investigations." He responded to the 2900 block of East 80th Street about 3:30 for a working fire" and was shot. Either way... these things should be impossible in a city that bans guns inside its limits. But they're not. Will the City of Chicago spend a lot of hard-earned taxpayer dollars to fight the NRA's suit? Why not spend some time and effort drafting a constitutional ordinance instead? I know things are supposed to get slower in the Summertime... but computers? Loading a page takes............f..o..r..e..v..e..r........ and leaving a comment? Almost out of the question. Can't. get. the. comment. window. open. Maybe it wasn't a good idea to use WD-40 on it to try and force it open. Could that be why the computer's so slow? But, for now, visit Nurse Ratched's Place and find out just why Darth Vader went wrong. Or, you could read about Detroit Tiger Brandon Inge's freak injury.... from a pillow. Arms, shall not be infringed. The slip opinion in District of Columbia v. Heller is 157 pages long. All of these pages were necessary, apparently, for the Supreme Court to affirm by a 5-4 margin that the Second Amendment (quoted above) prevents Washington D.C. from imposing a total ban on the ownership and use of guns. By my count, the Second Amendment clocks in at 27 words... so that comes to about 5.8 pages per word. There are two dissents. Justice Stevens' dissent starts at p. 68 of 157. The second dissent, by Justice Breyer, starts at p. 114. Almost all the mischief in interpreting the Second Amendment comes from the prefatory clause -- the bit about a well-regulated Militia being necessary to the security of a free people. At one point in our history, the Militia was every able-bodied male above a certain age. 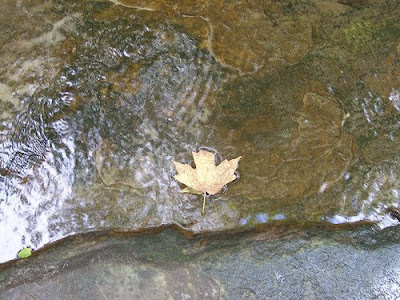 We might be called upon to grab our rifles or muskets or even a pike, if that was all we had, to go and repel invaders. You know: Indian attacks. The Redcoats are coming -- that sort of thing. Later, "militia" began to be associated more with the National Guard. Back when I was a lad, the National Guard was something that a young man could enlist in and thereby avoid the draft -- and overseas service. There was that police action in Vietnam, for example, that boosted National Guard enlistments dramatically. Although the National Guard might be "federalized" for specific purposes -- Eisenhower made threats along these lines to force state compliance with school desegregation orders, for example -- it was a rare thing. But even a generation ago, a state National Guard unit was identifiably part of the state from which it was drawn. Today, though, National Guard service guarantees long stints overseas in Afghanistan or Iraq or anywhere else the military is assigned. Guardsmen are under federal orders almost constantly -- they face all the dangers that our soldiers and sailors and marines in regular service face... only, all too often, without the same training... or armor. But embedded deep in our national psyche is a fear that, without guns in our homes, a government could become oppressive and tyrannical, trampling on our liberties. We the people are the ultimate guarantors of our liberties. We do not trust that government will always be on our side in our quest to remain free, and on some level we believe that the threat of a well-armed popular uprising helps keep government in its place. An outright ban on the possession of firearms, as in Washington, D.C., or here in Chicago (our ordinance is about as onerous as the District's) obviously triggers that deep-seated fear. That said, I'm ambivalent about today's decision -- which, of course, I can't have had time to study yet in any great detail. Justice Stevens may have the better side of the argument -- that the Second Amendment refers to a collective right to a Militia, not to an individual right to keep guns at home -- at least in terms of the precedents of the Supreme Court -- if you could call today's National Guard anything other than an adjunct of the federal military. Still, even before today's opinion, I have wondered why gun ownership has to be dependent on the reading of the Second Amendment arrived at by today's majority. The Ninth Amendment provides, "The enumeration in the Constitution, of certain rights, shall not be construed to deny or disparage others retained by the people." Wouldn't the right to keep arms -- surely recognized from Colonial times -- be a "retained" right -- even if the Second Amendment were deemed to apply only to "militias"? I make no pronouncements here, even tentative ones; I merely ask the question. The other aspect of the gun ban that bothers me is why the District of Columbia fought so hard to keep it in place. It obviously doesn't work: Criminals have guns. Lots of guns. Here in Chicago, with a similar law in place, gang-bangers shoot guns at and kill each other with distressing regularity, occasionally taking down innocent bystanders either by accident or because of mistaken identity. It turns out that criminals may not care that much what the law says. Therefore, the only people who don't have guns are law-abiding saps. Still, this is not a constitutional objection: Stupid laws may be constitutional, too, you know. Nor am I entirely clear on how arming the law-abiding saps would help keep gang-bangers from shooting up the streets. On the whole, whether it's just a manifestation of my deep-seated American psyche or not, I think an out-and-out ban on the possession of firearms in any locality is bad... I just don't know, yet, that today's decision is particularly good. I get tired of being lied to by those we choose to lead us. Hoping to overcome longstanding Congressional objections to drilling for oil offshore and in protected areas of Alaska, we are being told that the current oil price crisis is the simple result of the law of supply and demand. Demand is growing worldwide, particularly in India and China as the economies of those nations rev up ever faster. But OPEC denies there's any unmet demand. Disinclined as I am to agree with anything that the Arabs, Iranians or Hugo Chavez have to say, it would appear that they're correct. If demand for oil really exceeded supply we would be experiencing shortages, not just higher prices. I remember shortages: I was a brand-new driver in 1973 and 1974 during the Arab Oil Embargo. Gas prices went from 35¢ a gallon to 60¢ a gallon -- when it could be bought at all. Long lines. Signs that said 'no gas today.' That's what happens when demand really exceeds supply. That last link would take you an article on Bloomberg.com which also says that the per barrel price of oil has dropped a bit in the last couple of days, from a high of $139.89 to around $134. Did you ever wonder how much oil is in a barrel? Wikipedia says that, although oil is no longer shipped in barrels, the standard measurement is one barrel equals 42 U.S. gallons. A little less than half of each oil barrel is refined into gasoline; the rest becomes jet fuel or heating oil or some other product. But once we know how many gallons there are in a barrel we can figure out what the current market price is in dollars per gallon. All we have to do is divide the price per barrel by 42. Thus, assuming a price of $134/bbl, the market price is approximately $3.19 per gallon of oil. Time Magazine reported in its April 22, 1974 issue that the pre-embargo price of Arab oil was $4.65/bbl. "Panic bidding" brought oil prices up to $17/bbl during the embargo, according to this article. By November 1975, Time reported that the price for "new" oil was $14/bbl. Translating, before the embargo, when gasoline prices were in the 35¢ per gallon range, oil cost 11¢ per gallon. By November 1975, after the crisis was past -- but with prices still up at 60¢ a gallon -- oil cost about 33.3¢ per gallon. The price of gas has gone up by a factor of nearly 12 since pre-Embargo days... but the price of oil has increased 29 times its pre-Embargo price. The price of gasoline has gone up 680% since late 1975 -- but the price of oil has gone up 950% since then. No, I can't figure out what all this means either... except that I know it's not just as simple as supply and demand. That's a fiction. I'd like some facts. A note about some of the links in this post: Time Magazine has a free, searchable archive of articles from the 1920s to the present day. This is a fabulous resource that I only recently discovered. Are other newsmagazines offering similar archives? Come back with me in time, to a time when televisions received analog signals in glorious monochrome. Or do you say black and white? Herewith a snippet from "What's My Line?" with the mystery guest... Heifetz? Five minutes and 34 seconds, but -- I would suggest -- well worth the investment. But I'm still here -- a little red-eyed and puffy -- after the debacle this weekend at Wrigley. After Mass yesterday, when there was still hope of getting out of Dodge with at least one win, I and the rest of the family were accosted by our pastor, Fr. 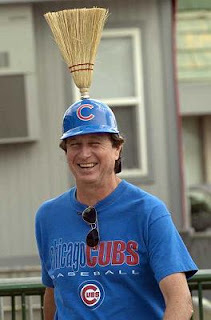 Ed (no, not his real name), a life-long, true-blue Cub fan. We took it with as much grace as we could muster. Most of the time, we actually like Fr. Ed... but yesterday? Not so much. Still, we live in Cub Country, on Chicago's Far Northwest Side. And, at the moment, they are firmly in control of the City's bragging rights. But next weekend is coming.... We can still get out of this with a tie for the season series. And -- although I haven't verified this independently -- Middle Son assures me the White Sox split with the Chubs, er, Flubs, er, that Chicago North Side baseball club in 2005, too. To be more precise, a 4½ foot American alligator was found Friday, alive and feisty, in the Chicago River. And, now, writes Owen, Bubbly Creek "has a bountiful fish population, which the alligator likely fed on." 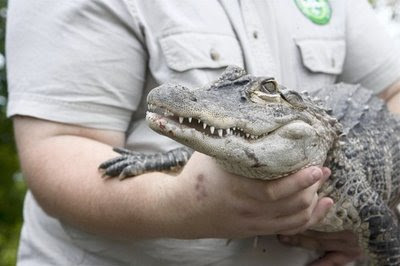 The alligator's "diet includes rats, birds and fish." You know, they used to laugh at the first Mayor Daley when he said someday people would fish in the Chicago River at lunchtime and catch fish to eat. So the restoration of this worst possible branch of the stream to a place where even exotic wildlife can flourish... that's a good thing, I think. But alligators? I'd prefer not to catch such a beast at lunchtime or any other, thank you. It's on the front page of the Chicago Tribune this morning: Northwestern University will offer a two year program leading to a law degree. Jodi S. Cohen's article says that NU will satisfy the ABA's 24-month enrollment requirement and 20 credit hour per semester maximum by squeezing "the credits into five semesters by starting in the summer, taking extra courses each semester and picking up one or two credits through mini-courses between semesters." According to Cohen, former University of Chicago Law School Dean Geoffrey Stone labels the two year program "irresponsible," saying it may produce "inferior lawyers who haven't had time to develop intellectual and analytical skills." Other scoffers were also quoted. Pardon me while I scoff at the scoffers. Mind you, I'm not buying into Northwestern Dean David Van Zandt's sales pitch. He says, according to Cohen, that the new program will be different in that it will require courses in "quantitative reasoning, including accounting, finance and statistics; and the dynamics of legal services behavior, including skills such as teamwork, leadership and project management." None of that junk is on the bar exam! Every state requires would-be lawyers to take and pass the bar exam. But in order to get a seat for the bar exam -- in almost every state -- you have to have a degree from one of these ABA-accredited law schools. So -- you get a degree and mountain of debt and all you have to show for it is a ticket to sit in on the bar exam. But, especially if you went to a fancy-pants law school, you have no way of actually passing that exam without taking the bar review course. So... you sign up for that, too. I suspect that a bright high school graduate with decent language skills could take the bar review course and pass the exam in virtually any state. I'd bet money that almost every reasonably bright college graduate could do so, without ever listening to even one lecture by some professor who's never seen the inside of a courthouse claim he's teaching you to "think like a lawyer." One other point about today's Tribune article. The article reveals that students in Northwestern's traditional three year program faced a $42,672 for the academic year just concluded. I'll pause while you let the enormity of that number roll around in your head. $42,672! My first year law school tuition, some 30 years ago (and not at Northwestern), was just under $2,000. And it was outrageous then. $42,672! And here's the punchline: Van Zandt told the Tribune's Cohen that school officials 'have not decided' whether students in the two year program will pay the same as those in the three year program. Does anybody want to make a bet? Long Suffering Spouse had surgery only last week. Sent home after only 36 hours, she discontinued the really heavy-duty pain medicine only a few days later because she needed to resume her duties as chauffeur. She's under doctors' orders not to lift anything over 10 lbs. and to limit bending or stooping -- even sweeping and vacuuming are expressly verboten. She has so much to do, she says, and she can do so little. It's frustrating. But -- other than that -- she's doing fine. Really. It's only my opinion, but I think she's recovering better and faster than she did last December when she had her gallbladder removed. Older Daughter was home visiting last week from Champaign -- on a break from nursing school -- but her trip did not become a classic busman's holiday. Older Daughter arrived before Long Suffering Spouse went into the hospital. Long Suffering Spouse returned home on Wednesday evening and Older Daughter had to go back Downstate on Sunday. It's not that Older Daughter had no opportunity to try out her budding skills as a nurse... but she was most helpful getting her youngest sibling to and from his events and in keeping the dishes from piling up to the ceiling. Fast forward to Monday. 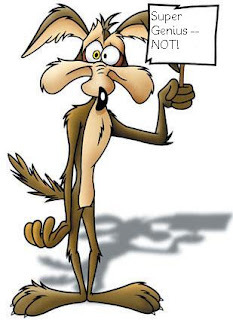 Late Monday evening Younger Daughter told me that the refrigerator in the basement didn't seem to be cooling properly. Yes, like a lot of big families we have a frig in the basement... for overflow stuff. It's pretty packed from just before Thanksgiving and through Christmas, and then again at Easter, but during most of the year it just has to keep the spare loaves of bread or the extra gallon of milk. And also stuff that isn't needed right away or maybe ever. Such as Oldest Son's beer from... when? A year ago? He moved out a year ago... so maybe longer than that. The freezer in the basement frig tends to be more crowded all year round: Market Day meat or veggies, frozen pizzas for emergencies, a turkey carcass for eventual soup stock.... You have the picture. But on Monday the basement frig was bursting at the seams. As you might expect, Long Suffering Spouse had planned for her recuperation by laying in abundant supplies and preparing as far in advance as possible. She tried to explain that to her own mother... but failed utterly: Abuela had reacted to her daughter's hospital confinement by cooking. And cooking. And cooking. Not everything was actually edible... but all of it took up space. Lots of space. We had moved that frig from the old house... and it wasn't new then. And now, on Monday, Youngest Daughter was telling me that it wasn't keeping very cool. "I didn't tell Mom," she told me. "I didn't want to bother her." Tuesday morning I had occasion to inspect for myself. Long Suffering Spouse sent me down for a loaf of bread. It wasn't particularly cold. Despite Younger Daughter's advice, I told Long Suffering Spouse. Do I look stupid? Inspection quickly proved that the frig wasn't particularly cold because, in technical terms, it was busted. Meanwhile, Younger Daughter had departed for a two day college orientation, Middle Son had gone to work, and Long Suffering Spouse insisted on letting Youngest Son sleep. So she emptied the frig -- a task that, I am almost certain, involved more bending and stretching than her doctors would have liked -- while I went into the garage and attic for coolers and off to the store for ice. Long Suffering Spouse culled mercilessly, but she still filled a large bag of stuff she wanted Abuela to take back to her house and put in her freezer. That took awhile. A widow, Abuela lives alone; nevertheless, at least since the promised Armageddon of the Year 2000, Abuela's giant freezer is always full to bursting. Some of the food in there has, no doubt, been there since the year 2000... and some may be older than that. I think it was late Tuesday afternoon when the repairman showed up to deliver his verdict: The refrigerator could be repaired... but parts for the nearly 20-year old machine are hard to come by. In a week or so, the parts could be found, probably, and these could be installed within a day or two thereafter... and it would cost only slightly more than a new frig. So Long Suffering Spouse went out yesterday morning and bought a new frig. It is expected some time this afternoon. And it occurred to me how much of a hassle this would have been under ordinary circumstances -- even if Long Suffering Spouse weren't mending after surgery. And then the phone rang this morning shortly after Middle Son had left for work. It was Middle Son. He'd been rear-ended. He'd been thrown around a bit in the collision... but he seemed fine when I caught up with him at the police station. And our car fared pretty well, all things considered, given the force of the impact. And I can't explain how busy it is at work right now. Not when I've taken this much time explaining all this. This rings true, doesn't it? There are patient people in this world. People who can wait in line with stoic mien and calm demeanor, even when waiting... nearly forever... to renew a driver's license. I am reconciled to the fact that, whatever line I choose, in a bank or department store, at the grocery or at a toll booth, will inevitably be the slowest moving. You might see me in such a line, a blank expression on my face and an air of seeming nonchalance, but do not confuse that dull, vacant look for serene acceptance of my lot. It really is just a dull, vacant look -- defeatism, just this side of despair. Every day I wait for the mailman -- yes, letter carrier is more gender neutral, but it's five syllables where two will do just fine -- I wait for the mailman like a hawk or an eagle in a tree, ready to swoop down the moment he (or she) is spotted. When I had an office on the second floor of a converted house, some years back, I literally did swoop down the stairs at the slightest jiggling of the mail slot in the door. Sometimes it was just the wind. And there were times I nearly broke my neck stumbling down those stairs. But I always harbor great hope that -- maybe -- just maybe -- today will be the day when the letter carrier (there -- are you happy now?) finally brings a check. You'll recall the movie Casablanca, of course, when Captain Renault orders a bottle of champagne for Victor Lazlo and Ilsa Lund. Victor wants no favors from Renault and tries to demur -- but Captain Renault waves him off. "Oh, please, monsieur. It is a little game we play. They put it on the bill, I tear up the bill. It is very convenient." Sometimes it seems that my clients feel much the same way about my bills. Rick and Ilsa always had Paris. I'll always have receivables. It's just... well, Messrs. MasterCard and Visa don't accept my receivables as payment of their bills. My clients take 60 or 90 or even 120 days to pay... when they pay at all... and Discover Card and American Express want theirs in two weeks. And, though I might devoutly wish otherwise, I'd never get away with a $39 charge just because my client made a payment one day "late." I don't much care for hardware stores. There! I've said it and already I can feel relief coursing through my veins. Oh, I can appreciate the old-fashioned hardware store, wood floors, wood shelves, a loft maybe, and wood ladders that could take you from open bin to open bin of every sort of fastener ever made. I can appreciate it because it's old fashioned... and so am I. But the "big box" hardware stores of today with associates in matching aprons and hard shell plastic on everything and gaudy displays of power tools? It does nothing for me. I don't care about power saws. Or drills. Some might attribute this to a traumatic incident from my childhood: Back in junior high I was forced to take a shop class, very much against my will. But I was not traumatized by this at all. Nor do I claim any loss at being denied the opportunity to burn cake mixes beyond recognition. I have several times since proved that I am just as inept in a kitchen as in a wood shop. No, if anyone was traumatized by my brief and inglorious career in shop class it was the poor instructor: "My disaster," he called me, before going home at night to calculate whether he'd accumulated enough pension credits to retire immediately. Anyway, we both stuck out the semester. All the kids were required to build something as a final project. Some of the showoffs undoubtedly made scale replicas of the Lunar Lander. I really wasn't paying attention to them; I was busy working on my bookshelf. The bookshelf project was the result of extensive consultation between me and the shop instructor. He was entirely convinced that I would lose several fingers and perhaps a limb, but some sort of project was required. My suggestion that I make a paperweight was perhaps appreciated more than I realized at the time... but still rejected. So I made a bookshelf. A rather trapezoidal bookshelf, as it turned out. An attempt was made to screw in the shelves, but the plan was abandoned as the semester flew by. Also, I was far less likely to put out anyone's eye with a hammer and nail as opposed to a power drill. When the project was finished, the instructor was thrilled. Neither of us lost any limbs or other body parts in the course of making that bookshelf. And I actually used it, at home, for a number of years. With books, no less. And, though I've gotten older, and I can't possibly be as uncoordinated as I was back in junior high, I still don't like hardware stores. But I still like books. Youngest Son went 2 for 3 at his summer league game the other day and he was pretty pumped about that, but what he really wanted to tell us was that he scored from second on a bunt. This assertion was met with some skepticism in our house. Youngest Son was not blessed with blazing speed. Youngest Son was greatly encouraged by his grammar school baseball coach who stressed that even a slow kid can be a good baserunner. And he's worked hard at increasing his speed -- he runs several times a week, even when nobody's watching. And maybe it is no longer accurate to say that we'd have to time him with a sundial... but Olympic sprinting is not in his future. Thus, our hesitance to immediately accept his representation that he scored from second on a bunt. A few probing questions seemed in order. Middle Son asked, "Did the first baseman break his leg?" But Youngest Son insisted, and he told the tale again. And, no, he stressed, the first baseman did not break his leg going for the bunt. One of the assistant coaches on the Youngest Son's school summer team was a teammate of Middle Son's in high school and college; Middle Son pulled out his cellphone and called him. You can't get away with anything at our house. Youngest Son has football camp off and on during the summer and he's playing for two baseball teams -- a school team coached by his freshman coach and a Colt league. The Colt program he's joined fields two teams in their league, one populated mostly by 15-year olds, like Youngest Son, and the other populated by 16-year olds. It's a 16-year old league, which is why I'm calling Youngest Son's 15-year old team "Trial By Fire." Trial By Fire is coached by the league director and he works hand in glove with the sophomore coach at Youngest Son's school. The sophomore coach runs the older team. I'll call that team "Great Expectations." Youngest Son thought this was a pretty sweet set-up, especially because his school summer coach used to assist with Trial By Fire. Then he found out that the school summer coach can't get along with the coach of Trial By Fire. They do not speak. Youngest Son had hoped, of course, that they would talk frequently -- and preferably about him. That left a limited opportunity to make an impression with the school's sophomore coach. The chance came a couple of Sundays ago, on a mercilessly hot day. Great Expectations swept Trial By Fire in a doubleheader, as (yes) expected, but Youngest Son participated in a meaningful and positive way. He caught five innings of the first game and was the starting pitcher in the second. And he apparently succeeded in making the desired impression. Youngest Son's been kind of worn down this week. Football camp has kept him late on a few nights this week and he's had several school summer league games. And he's still got summer school. His computer course ends today with a final -- but that was the only event on today's docket. No football today. No summer league. Nothing for Trial By Fire. He was looking forward to coming home and lazing around the house -- but then the Great Expectations coach asked him what he'd be doing today. "Nothing," he said, and you can see why he said it: He had no sports-related events scheduled. "Are you supposed to pitch this weekend?" asked the sophomore coach. "Yes," Youngest Son replied, curious as to what this might be all about. "Then I won't pitch you," the coach said. "But I'd like you to catch for us on Friday. We have a doubleheader and we're going to be short-handed." "Sure, Coach, I can do it," Youngest Son said. "Well, check it out. I'll call this evening to confirm." This was the very first bit of information about the day's events that Youngest Son chose to share with us last evening when he returned from football. He may have been entirely through the front door when he told us. And, eventually, the coach did call. There was, however, a small problem. Great Expectations is supposed to play today in a tournament Downstate -- and the first game was scheduled for 9:00 a.m. They could take Youngest Son from school at 6:30 a.m. -- but I had to tell the coach that he could not go. There was the small matter of that final. If the game had been closer by or later in the day we might have worked something out. But I couldn't let him do this. Youngest Son was unhappy. "If I'd known about this just a day earlier I could have taken my final yesterday," he lamented. Apparently some of the kids in his class have a basketball tournament this weekend and they'd made arrangements to take the final early. The coach understood the problem and he promised to call again should a need arise. That was the spin I put on it with Youngest Son: You've made the impression you wanted to make. Your hard work is reaping at least a partial reward, I told him. Did England repeal Magna Carta on Wednesday? A measure narrowly passed Britain's House of Commons on Wednesday which would, at least under certain circumstances, allow civil authorities to detain terror suspects for up to 42 days (up from 28) without bringing charges of any kind. Here's a link to the story as I heard it this morning on NPR (not that I could get the link to work, you understand, but you may fare better). The Reuters account of the vote may be found at this link; here is a link to coverage from the BBC. Thirty six Labor MPs deserted their party in this vote (very unusual in British politics) including a number of former government ministers. The slim margin of the government's victory was provided by an apparently last-minute decision of the Northern Irish Democratic Unionist MPs (Ian Paisley's bunch) to back the measure. Prime Minister Gordon Brown was obliged to deny any "deals" with the Irish group -- but there have been reports that extra cash was offered for projects dear to the Ulster MPs in order to obtain their assent. In his statement, Mr Davis said he wanted to force a by-election in which he intended to stand on a single-issue – to stop the "slow strangulation of fundamental British freedoms" by the Government, including the introduction of ID cards and the extension of detention without trial for terrorist suspects. "This Sunday is the anniversary of Magna Carta, a document that guarantees the fundamental element of British freedom, habeas corpus. The right not to be imprisoned by the state without charge or reason," he said. "But yesterday this house allowed the state to lock up potentially innocent citizens for up to six weeks without charge." It is interesting to note that Tory opposition to the measure was not entirely unanimous. According to the BBC, one Conservative broke ranks and voted with the Government, namely, "former Home Office minister Ann Widdecombe." The BBC provides time-stamped 'highlights' of the debate and vote. It quotes Home Secretary Jacqui Smith as saying "she cannot 'wish away the threat' of those whose sole aim is to 'blow away our citizens'.... She asks MPs to 'do the right thing to protect our people'." Under the guise of fighting "terror," a supposedly left-wing government has sought to further curtail personal liberties. Thus we see that the enemies of personal liberty are not just among the Right, as some people here in America seem to think. (I'm not sure that either the Republicans or the Democrats here are sufficiently supportive of civil liberties.) For my part, if "protection" from terrorists must be purchased at the cost of our my civil rights, I'll take my chances with bin Laden, please. Have you ever been the subject of a news story? Have you ever seen a spectacular accident on the highway or a fire down the street and waited anxiously to see how the story would be reported on the evening news? If you have answered yes to any of these, you've probably snapped off the TV or put down the paper in disgust wondering how anyone could have gotten the story so wrong. My own perception is that the closer you are to a news story, and the more you know about the subject, the less accurate you are likely to find the reporting. Now there's only one actual reporter that I know of who stops by this blog regularly and comments (and I'm surely not picking on you, Patti). I cast aspersions on no one at all. It simply occurs to me that -- though we're saturated with news -- not a lot of people read the news critically. And we should. My own rule is to try and read multiple stories about anything in which I'm interested. That gives me the best chance to get past the reporters' biases and preconceptions and to the truth at the core of the story. Now, of course, news writing is supposed to be bias-free -- opinions are for columns, the editorials and the op-ed page. But I had a journalism teacher in undergrad -- since passed away -- who said that was a bunch of hooey. Not only was it not in the best historical tradition of newspapering (you need only read a little history to know the truth of this) but it was also impossible. The best one could hope for, he said, was to be fair. To know you lean in a particular way... and make sure you consider the other side in writing your story up. Even if the news is reported 'straight' -- no bias being detected on even a critical reading of the piece -- how the story plays may reveal volumes about the editors' or owners' biases. Also, noting how the same story is handled by different outlets can give the critical reader a sense of the story's true import. Because not everything that runs on the front page of the XYZ Gazette will even be picked up at all in the XYZ Times. Here is a real life case in point. 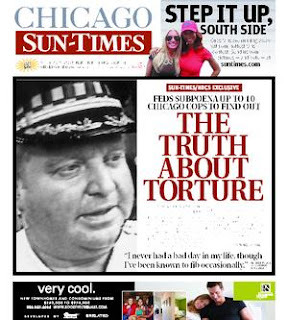 Yesterday the Chicago Chicago Sun-Times carried on its front page a story about the latest Federal investigation into allegations of torture by certain members of the Chicago Police Department working for Commander Jon Burge. That's the man pictured in the reproduction of the paper's front page, above. These allegations of torture go way back -- all the way to the 1970s. Even the most recent allegations of misconduct under Burge go back to the late 80s or early 90s. Some of the alleged victims of torture were convicted of capital crimes, and the alleged misconduct figured in the pardons and commutations of Death Row inmates issued some years back by then-Gov. George Ryan. The City of Chicago has paid out $20 million to settle some of the civil suits arising from some of these allegations. A special report paid for the by Cook County State's Attorney's Office, issued in 2006, concluded that no criminal charges could be brought against Burge or his subordinates because the statute of limitations had expired. Anyway, the Feds are apparently looking into whether they agree or disagree with that conclusion. In the Sun-Times, it was page one news. In the Chicago Tribune, though, the story played on page 11 of Section 2, next to the obituaries. When you read only one newspaper or watch the news on only one station, you're not getting the whole story. If you're concerned about a particular issue you need to broaden your horizons, and check out different sources. Try and read between the lines. In today's Heads or Tails challenge, Barb, that delicate bloom of the Blogosphere, has asked us to consider the word "flower." You're looking at a "corpse flower," the titan arum, in full bloom, this particular bloom from the United States Botanical Garden in Washington, D.C. in November of 2005. In its November 21, 2005 editions, the Chicago Tribune ran an AP article by Jacob Adelman concerning the event. 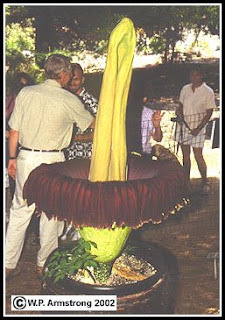 This titan arum, Adelman wrote, can grow up to 12 feet high in its native Sumatra, although the 2005 Washington specimen was only about five feet high. The plant was 14 years old when it produced its first blossom. And the reason why the titan arum is nicknamed the "corpse plant"? To put it politely... it stinks. It smells worse than the messy bedroom of a teenage boy on a hot day with the windows closed and the air conditioning broken. The plant emits an "odor," Adelman wrote, "that has drawn comparisons to garbage, spoiled meat and rotting fish." The stink is the secret to the plant's survival, as, in the wild, it is pollinated by carrion beetles. At right is a picture of the 2002 California bloom, obtained from this site. Now that you've seen a couple of pictures of the plant, perhaps you won't snicker quite so much when you learn that the scientific name of this oversized daisy is Amorphophallus titanum. You Classics students in the back -- stop it! Stop it now! The National Geographic article says that the scientific name "provides a clue as to why matrons of the Victorian age prevented young ladies from seeing" the flower in bloom. Looking at the pictures will provide another clue. I'll let you figure the rest out on your own. 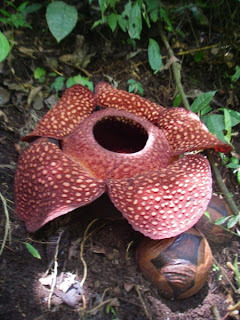 This "corpse flower" should not be confused with Rafflesia arnoldii, which is also sometimes called a "corpse flower." Wikipedia says that Raffelsia arnoldii is the largest individual flower in the world: "There are some plants with larger flowering organs, the Titan Arum and Talipot palm, but these are technically clusters of many flowers." Here is a picture, straight from Wikipedia, of the Raffelsia arnoldii. Nothing in the shape of this corpse flower would necessarily give offense to Victorian ladies... but it also reportedly stinks of rotting flesh in order to attract the flies that pollinate this monster. You can find even more "carrion flowers" in this Wikipedia article. And if you buy some for your mother-in-law, you're on your own. I never feel more helpless -- and stupid -- than when I am seeking repairs for an automobile. I know virtually nothing about cars except, arguably, how to drive one. Middle Son was lamenting just the other day that he, too, is not a "car guy." Predictably, he said this was my fault. "If the dad's not a car guy," he explained to his mother, "the sons won't be car guys either." Long Suffering Spouse rose to my defense, sort of. "Not so," she told Middle Son. "It's not something that necessarily runs in families. Your grandfather was definitely a car guy, but your father isn't." "That's the point," said Middle Son. "Dad wasn't paying attention -- again -- and now I have no example to follow." "Hmmmmmmmmmm," said Long Suffering Spouse, reconsidering. "Lord knows, your father doesn't always pay attention." The truth is I am not a car guy. And I am ashamed to admit it. Of course, I don't have to admit it in the presence of real live car guys. They know. They can sense it. And, of course, they take full advantage whenever I present a vehicle for repair. I can't blame them, of course, any more than than a zebra could blame the attacking lion. Just like the doomed zebra, though, I wish that someone else had been selected as a target. The latest illustration of this sad truth began over six months ago. Long Suffering Spouse brought the family van in for an oil change. When the oil change guys suggested that she also have the tires rotated, she assented. At some point, she tells me now, she began to think it was taking an inordinately long time to take the wheels off and put them back on. Especially when they use those pneumatic drills. But no one told her anything was amiss until she went back for the next scheduled oil change. Tire rotation was again suggested and she again agreed. But now the lug nuts wouldn't come off on one wheel. Someone had cross-threaded the lug nuts on the wheel studs and forced them into place instead of rethreading them. And with a pneumatic drill you can apply a lot of force. Two of the wheel studs snapped off rather than yield up the lug nut firmly affixed thereto. The oil change people told Long Suffering Spouse all this and thought they were entirely off the hook when she pointed out that they were the only ones who had rotated the tires. They consulted their computer records and saw that she was right. They promised to order replacement parts and repair the damage. But we didn't hear back from them and, in the press of events, forgot about it until the next time the oil was due for a change. Now Long Suffering Spouse sent me in her stead. I found they had the parts, sitting in the bottom of a can in the store's small office. They'd been there long enough that no one quite remembered why they were there. Until I reminded them. Ah, yes, I was told... but we can't do this today. You need the Assistant Manager and he, they said, was off that day. Come back, they said, on a Sunday when things are slow and he's here. Well, things aren't slow in the Curmudgeon household on Sundays and the van is usually at the center of family activities. But after baseball a couple of Sundays back, I brought the van in... only to be told they were closing. I went back again on Friday. I had a meeting in the suburbs and I had negotiated the use of the family van to travel there and back... so I brought the van in and found the Assistant Manager. Yes, he was indeed the one to do it... but not then. See, he'd have to bring different tools from home. "Confidentially," he told me, "the ones we have here are terrible. But I'll bring in my tools and we'll get it done. Bring it back on a Sunday when things are slow." Well, it rained yesterday, wiping out Youngest Son's doubleheader and leaving me with no choice but to bring the car in. .............and a half hour later the Assistant Manager told me that he couldn't do the job. In fact, he'd broken another wheel stud. "But," he told me, "my father can do this in 10 minutes." His father, it seems, works in a garage all the way across the North Side. "My father says you can drive on three studs if you drive normally. Take it over to him now; he's waiting for you." What choice did I have? I went, taking with me the parts that the Assistant Manager had been unable to install. The garage was attached to a gas station. There were four service bays and a big side lot where cars in various stages of repair were situated. There were three tow trucks parked by the street, too, each one bigger than the next. And there was the Assistant Manager's father waiting for me, as promised. He took the car in, put it up on a lift, and -- after lots of banging and clanging -- got the wheel off. I could tell that much without being a car guy. I could tell, too, that it was taking a lot longer than 10 minutes. Eventually, the Assistant Manager's father came out and found me, where I'd been loitering in the gas station driveway, to tell me that the parts I'd brought with me were the wrong parts. "The wrong parts?" I asked, stupidly. "How can they be the wrong parts?" But my new friend (we'll call him Eduardo) had no answer to that question, only a proposal. He'd call Muhammed, the guy from the nearby auto parts store and ask him to bring over the right parts. A little while later, a white pickup truck pulls up and a young man in a red shirt and black trousers jumps out with a small bag and a sheet of paper and goes looking for Eduardo. I hung back, watching at a respectful distance, hoping that this might now be over, wishing I had more cash with me because I could see that this free 10 minute favor that a father was doing for his son was going to cost me money. Especially now that Muhammed and the auto parts store were involved. But I was premature. Muhammed had also brought the wrong parts. Muhammed tried again, going and coming back in his little white pickup truck, but Eduardo still wasn't satisfied. No, he said finally, a new wheel would have to be procured and installed. But the wheel could not be ordered until the morning. I could leave the van there overnight and pick the car up on Monday afternoon. By this time -- hours later -- I was a bit numb, but I don't think I misheard the price of the new wheel: $266. And I don't know what the garage will charge to actually install it. I hope that all of this was necessary. But I don't know whether it is or not: When it comes to auto repairs, I can't tell bulljive from bullion. In the meantime, we're down to one working auto at home, and summer jobs and summer school are pulling family members in every direction. Yes, yes, I'm hoping that the oil change place will reimburse me. But first I'm hoping I get the van back without any additional problems. Kacey, of Cookie's Oven, was kind enough to send me a copy of a letter about Barack Obama that had circulated into her email the other day, inquiring whether I'd seen it. I had not -- and I am grateful to her for passing it along. What Kacey sent me was supposed to be a column by Ken Blackwell, an African-American Republican, that appeared in the New York Sun. I was unfamiliar with Mr. Blackwell or the Sun but, as you will note if you follow the links, the person and the paper do exist. Still, as I read the letter, I knew where I'd have to go next: Snopes.com, the best source I know of for tracking down Internet rumors and fabrications. It's an amazing time to be alive in America . We're in a year of firsts in this presidential election: the first viable woman candidate; the first viable African-American candidate; and, a candidate who is the first front-running freedom fighter over 70. The next president of America will be a first. Next, consider economic policy. For all its faults, our health care system is the strongest in the world. And free trade agreements, created by Bill Clinton as well as President Bush, have made more goods more affordable so that even people of modest means can live a life that no one imagined a generation ago. Yet Mr. Obama promises to raise taxes on 'the rich.' How to fix Social Security? Raise taxes. How to fix Medicare? Raise taxes. Prescription drugs? Raise taxes. Free college? Raise taxes. Socialize medicine? Raise taxes. His solution to everything is to have government take it over. Big Brother on steroids, funded by your paycheck. Finally, look at the social issues. Mr. Obama had the audacity to open a stadium rally by saying, 'All praise and glory to God!' but says that Christian leaders speaking for life and marriage have 'hijacked' - hijacked - Christianity. He is pro-partial birth abortion, and promises to appoint Supreme Court justices who will rule any restriction on it unconstitutional. He espouses the abortion views of Margaret Sanger, one of the early advocates of racial cleansing. His spiritual leaders endorse homosexual marriage, and he is moving in that direction. In Illinois, he refused to vote against a statewide ban - ban - on all handguns in the state. These are radical left, Hollywood , and San Francis co values, not Middle America values. The real Mr. Obama is an easy target for the general election. Mrs. Clinton is a far tougher opponent. But Mr. Obama could win if people don't start looking behind his veneer and flowery speeches. His vision of 'bringing America together' means saying that those who disagree with his agenda for America are hijackers or warmongers. Uniting the country means adopting his liberal agenda and abandoning any conflicting beliefs. But right now everyone is talking about how eloquent of a speaker he is and - yes - they're talking about his race. Those should never be the factors on which we base our choice for president. Mr. Obama's radical agenda sets him far outside the American mainstream, to the left of Mrs. Clinton. The anti-christ will be a man, in his 40s, of MUSLIM descent, who will deceive the nations with persuasive language, and have a MASSIVE Christ-like appeal....the prophecy says that people will flock to him and he will promise false hope and world peace, and when he is in power, will destroy everything. Is this anti-christ,.......... OBAMA?? you can! Each opportunity that you have to send it to a friend or media outlet...do it! If you think I am crazy,. I'm sorry but I refuse to take a chance on the 'unknown' candidate. This is not from Mr. Blackwell's original column. And, when you break it up, as I've done here, you can see this more readily. But that's not the way it's going around the Internet. I don't intend to passively let a pirate of the Internet distort my commentary. With freedom comes responsibility. When we exercise our right to speak, we should do so honestly, transparently, and prudently. We owe that to our readers and the integrity of the Internet. It is inevitable that such hijacking, distortions, and abuses will happen on the Internet. It is just part of learning what it means to have this powerful new frontier available to us to speak and advance ideas. And as we do, we all share the duty to use it responsibly. Though the Founders could never have envisioned the Internet, our responsible and honest use of such a powerful forum would make them proud of the nation they created. You may agree wholeheartedly or disagree violently with what Mr. Blackwell actually wrote about Senator Obama. But, in my opinion, it's kind of hard to argue with the idea that we need to be responsible in our use of the Internet. How Middle Son chose accounting? Today I will tell you something I'll always suspect... but can never prove. I do not present this as fact, merely as informed speculation. Speculation, in other words, based on my own experience when I was roughly his age. I did work every summer in college, and what I earned was put toward school -- and in those days even a low paying summer job made a much bigger dent in tuition than even a high paying job does now. But doing in three years what ordinarily takes four was my principal contribution to defraying the cost of my undergraduate education. But I was a history major. My father was a practical man and he had no illusions about my being able to take my diploma and do something productive, so he offered me a choice. He'd help me out with graduate school, he said, but only if I pursued either an MBA or a law degree. What about a graduate degree in history? I asked. I did go to the career office to see what sort of job I might get with my newly minted degree in history. Whether it was a book of clippings or just cards and phone messages on a bulletin board, it soon became apparent to me that I had two choices: Sell life insurance or go to grad school. Getting an MBA seemed like another way of getting into a career in sales... and I knew I'd be lousy at that... and so... just floating downstream... blindly following the path of least resistance, I chose the law. And now to Middle Son. It was his sophomore year and they were taking pictures for the baseball roster to be posted on the school team's website. Every player was listed by name and hometown... and major. Middle Son didn't have a major at this point. Baseball was what was keeping him in school. But, when called upon to do so for the team website, Middle Son made a choice. I believe -- though, as I said, I cannot prove -- that if majors had been listed in reverse alphabetical order, we might be talking about him finishing up his zoology major. Photo obtained from Mystsong2000 on Flickr. I mentioned yesterday that Youngest Son starts Driver's Ed soon -- just after he finishes his summer school class in computer use. It's required at his school... but they work the schedules so most kids have to take it in the summer, either before or after their freshman year. It's just a little larcenous. Anyway, he chose after. And Youngest Son was chosen to play on the school's freshman summer league baseball team. Most of their games are on weekdays. So to maximize his playing time, he tried out for and made a 15 year old travel team... that plays in a 16 year old league. It's called trial by ordeal. That's not the name of the team (although it may be it's name here, if I write about them); it's what they're in for in this league. Anyway, this team plays mostly on weekends to avoid conflict with the various school teams from which it draws players. And did I mention that football camp started this week? Just a couple of days this week -- there are strict limits on these things imposed by the state high school association. And camp is in the evening, so as not to conflict with baseball. Youngest Son was lamenting his busy schedule with Middle Son the other night. Though they live under the same roof, you've just seen part of the reason why they don't often get a chance to talk. Middle Son responded with a recitation of his own summer schedule. He got a full-time internship in a nearby accounting firm. (This is where we go into one of those good news-bad news routines: The good news... the office is nearby and, we thought, even if he drove the car could be accessed by another family member in need. The bad news... he's been put on an auditing project... in a far western suburb... which can not be accessed by public transportation... even in Al Gore's imagination. The good news... the internship is paid. The bad news... at this rate, his pay will go mostly for gas. The good news... his school will let him earn college credit for this internship, too. The bad news... the school expects payment for giving him hours to work for a third party... and they demanded payment up front. Anyway, Middle Son is working full time... at least eight hours a day... and with commuting more like 10 or 11. He still has to stay in shape for baseball. He wants to start lifting in the morning so he can maintain a more reasonable throwing schedule in the evenings -- but that's on hold until he finishes this project in the far western 'burbs. In the meantime, he's lifting and throwing in the evenings. And he has a summer team, too. A couple of his teammates were invited to a summer league in Idaho, where they will be seen by pro scouts -- but Middle Son was not invited. So he'll play in a local college league, a league that, he says, has been upgraded this year. And he's trying to graduate with 150 hours. Apparently that's a prerequisite to taking the CPA exam and employers want kids who, if not already CPA's, are at least CPA-ready. I guess that's like cable-ready or something. But because he did not start out his undergraduate career with this goal in mind, he's got some catching up to do. Taking max academic loads this year and next won't be enough. He needs the six hours he negotiated with the school for his internship... and he needs nine more besides. So he's signed up for three on-line courses at the local junior college. No, I don't know when he'll have time for these either. Neither did Youngest Son, who promptly conceded the game of 'can you top this' when his brother laid the facts before him. At which point, perfectly harmless (and funny) comics, like this installment of Pardon My Planet, will become troublesome... even painful... for me. You thought I was getting cranky before? Unfortunately, every newspaper, every news report, shows just how long a run it's going to be... but that's why we have to pray harder. For more on today's Blogblast for Peace, visit Mimi. In today's Heads or Tails challenge, our very own Duchess of the Dictionary, Barb, has asked us to consider the word "royal." There are a lot of ways to go with this -- I could go political: I wrote this morning, for example, about Chicago's very own Fr. Michael Pfleger who's long been a royal pain in the tuchis for the Archdiocesan hierarchy.... Or I could talk about baseball. The Kansas City Royals are in town tonight, weather permitting, to face my Chicago White Sox... and if anything can awake the Sox' slumbering lumber it may be KC pitching. Or I could talk about the English royals -- always good for a story: Michael Sneed reports in her column in this morning's Sun-Times that QE II (the monarch, not the cruise ship, Bee) is not amused that Kate Middleton, the on-again, off-again girlfriend of the future King still has no full-time job, though she graduated from college four years ago. I guess the economy's tough everywhere, eh? But after thinking it all through, and I decided to talk about... Nepal. The fellow at left has lost his job and is being booted out of his home. 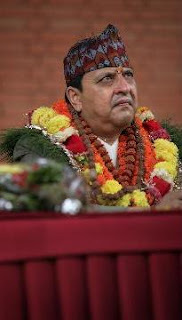 He is, or was, Nepal's King Gyanendra. An article today by Paul Tighe on Bloomberg.com describes how the ex-king has acquiesced to the Constituent Assembly's decision to declare his country a republic and require him to leave his palace by June 12 "to ensure the peaceful development of the Himalayan country." He may ask for additional time to pack, however. What Shakespeare said in Henry IV Part II is even more true today: "Uneasy lies the head that wears the crown." A Maoist party composed of former rebels comprises the largest party in the new Nepalese Constituent Assembly. Nepal shares a long border with Tibet... er, China. One can not help but wonder if, the next time Bob Seger wants to go to Kathmandu, he may require a Chinese passport? Francis Cardinal George from the Mayor of south suburban Crestwood. I'm pretty sure that Fr. Pfleger and I would disagree on many things. In fact, we probably wouldn't get along at all. But I have a kind of cockeyed respect and admiration for the man. So allow me to lag behind in the rush to judgment. A great many charismatic pastors forget who they're preaching about somewhere along the way. They become near cult figures themselves. And they build empires. For themselves. For all his faults, for all his wretched excesses, Fr. Pfleger has stayed within the Catholic fold. Not by much -- if you read Mr. Roeser -- but if the lambs that follow Pfleger are all over in the farthest corner of the sheepfold, they are still in the flock. You can click on the Archdiocese of Chicago website this morning (where you will find a statement of regret from the Cardinal concerning Fr. 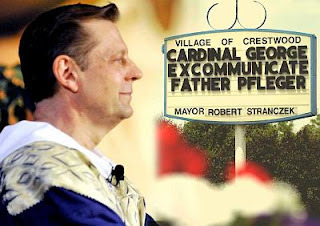 Pfleger's remarks) and you can find a link to this St. Sabina website. It's not the current link -- this is (you can read Fr. Pfleger's apology here) -- but the point is (though he may have threatened to leave from time to time -- see Mr. Roeser) Pfleger has so far stayed faithful to his vows and faithful to his Church. It surely must be tempting, and it surely would be more rewarding for Pfleger (in the short term, at least) to start his own church, build his own empire, and rake in all the cash for himself. The Michael Pfleger portrayed in this morning's Sun-Times interview, by Cathleen Falsani, is a very contrite-sounding individual and one who seems well aware of -- and willing to accept -- the superior authority of his bishop, Cardinal George. Of course, my blood pressure spiraled when I got to the end of the piece, where Falsani quotes Pfleger as saying, "This is a dangerous time in America, the freest country in the world... where you have to whisper your thoughts." No! You don't have to "whisper your thoughts" because these are dangerous times in America. Any responsible person always has to watch what he or she says because what is said, and where it is said, and how it is said, may have consequences. It's hard to disagree with Fr. Pfleger when he says that Senator Clinton conveyed a sense that she was 'entitled' somehow to the nomination -- her early campaign strategy was to make her appear to be the inevitable nominee. But whatever larger point Pfleger may have thought he was making (or later claimed he was trying to make) about race relations in mocking Senator Clinton was lost entirely because of who he has been -- a friend and active supporter of Senator Obama -- and where he was speaking, and in his clearly partisan tone. But I do not demand Fr. Pfleger's head. I do hope, though, he will learn... and grow... from this. So I had no time for Younger Daughter's graduation Saturday or Youngest Son's doubleheader Sunday. But of course I made time. I'll have to make it up... elsewhere. In the meantime, the brief in question has had me spending more time in dictionaries than I have since the third grade. When this brief is done, I'll have to come back here and write about what I've learned. For example, we've been living through Culture Wars in this country, of late, the hijacking of the definition of the word "marriage" being just one prominent example. But did you know the meaning of the word "culture" has also been altered? When there's time, I'll get to the library and get a stack of new books to read. But, for now, there's always a pile of books that I've been meaning to get to that I got from somewhere but that just didn't grab me for some reason or another. A few years back, somebody gave me a study of divorce practices in Virginia from the time of the Revolution until 1851. Didn't seem like riveting reading then... but it seems to me to be of interest now.